The Amish Furniture Solid Wood Craftsman Mission Double Dresser is an authentic Mission style dresser that can blend into any bedroom suite! This Mission dresser is built in the Old World tradition and will withstand the test of time. 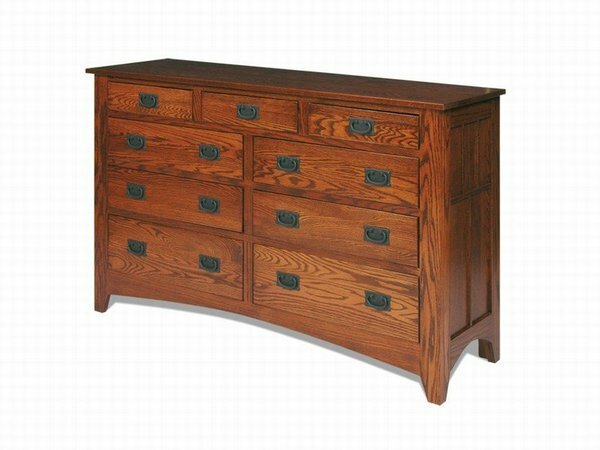 Be proud in purchasing a dresser that is Amish Made in the USA! - This Amish dresser is available in oak, cherry or maple wood and handcrafted by experienced woodworkers in Lancaster, PA.
- Select your favorite finish and then choose between standard black mission pulls or square wooden knobs for your hardware. - All drawers are dovetailed for years of everyday use, and there are three different drawer slide options available. - Light and heavy distressing is available if you prefer a worn look. - Choose a matte (low-sheen) varnish or semi-gloss (standard) varnish. - Finally, top off the newest member of your bedroom suite by adding on a matching mirror, two sizes are available - 48" or 60" wide. This Solid Wood Double Dresser is well designed and stylish with clean lines, carved panel sides and drawers that show off the solid wood grain. Plenty of options are available, so you can make sure that this dresser will match the rest of your bedroom suite. Give your bedroom the look and comfort of a village inn with the Amish Furniture Solid Wood Craftsman Mission Double Dresser! Please call us if you have any questions on this dresser or any of our other products at 866-272-6773! Our fully staffed team of Amish Furniture Experts will be happy to assist you in any way they can. We are also easy to reach at our email address - Questions@DutchCrafters.com. Thank you for shopping with us here at DutchCrafters! This double dresser is built to last a hundred years. The stain and varnish shows no blemishes at all. Very beautiful and extremely well made it. Love it. Thanks for the follow up, Jennifer. Everything was perfect, and we really like the quality craftsmanship of the furniture!